I truly believe this is a process and some choices I make now will change as I learn more about plastics and about my consumer habits and capabilities. I feel that waste-to-energy is a poor long-term solution that will adversely affect our climate and health future (sorry, Sweden). Plastics and their varying compositions are confusing, and never, ever recycled at the same level of quality as their original use. Therefore, I know that avoiding use is significantly better than relying on faulty recycling systems. I do continue to use plastic items. E.G. – When hiking, a simple ziplock screw top container is my friend; it is so light. I do “believe in” durable plastics. My kayak, for example, and insulation in buildings, make sense. Better would be if we could bring those items back into the manufacturing cycle when we are done with their first use. As you have seen in previous posts, I also hold the truth that there is not one right answer, but many. Nature is diverse, redundant, and systems-based. Stop trying to find one thing to do, or one way to do a thing. Do a lot of things. Build on my ideas, find more opportunities, and share them with me and others. On to my #breakfreefromplastic journey, underway. It amazes me that I, as enlightened as I am about sustainability, have no real idea how much plastic waste is in my life. And by waste I include so-called recyclable plastics, because I am not able to confirm the recycling, the systems are faulty, and the source and collection are complex and confusing especially as they differ town to town and country to country. It is also true that every time I find a plastic to reduce or to avoid I can see another plastic beyond it that further stymies my goal achievement. 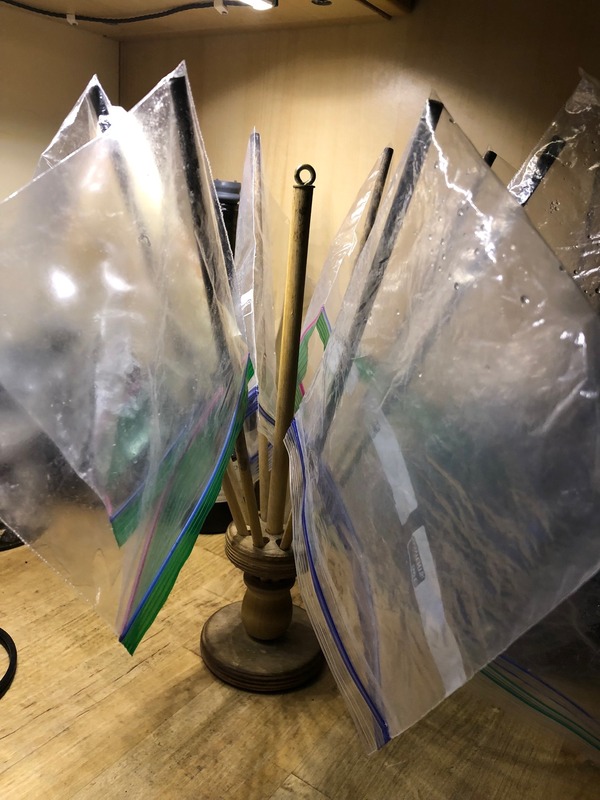 Plastic bags – Years ago we started to reduce plastic (Ziploc and grocery) bag use by washing and drying Ziploc plastic bags, reusing them until they ended up with a hole. (I almost wrote “became holy” there, but never want to dub anything plastic with a word that could imply spiritual good.) This is simple to do and has saved us money over the years as we use a lot of plastic snack and storage bags. I can say we buy new boxes maybe 1/8th as often as before. Once they are rendered useless by a hole, I rinse them, dry them, and recycle them with other film plastics. We also eat at Subway about once per week, for our family game night, and I started bringing my own bag to Subway to avoid their plastic single-use bags. Over the last eight years, we have avoided use of approximately 320 bags, just us, with just this one choice. We are also nearly zero in use of plastic grocery bags. Luckily a NY law requires groceries to take back plastic bags and other similar plastics for recycling if the store is larger than 10,000 sf. And we have enough reusable cloth bags for the whole town! Many people reuse plastic grocery bags for their garbage or for puppy poop, and justify getting the plastic bags for this reason. I strongly suggest this is counter productive, as it still allows plastics into landfill when they could be recycled. Take away containers, including foam and hard plastics – We always, always, always ask the restaurant if they have anything other than foam take-away containers, and when we order for delivery, we request avoidance of foam containers if possible. I have stopped ordering from restaurants that provide only foam containers. Even places that typically use foam are decent about bringing us tinfoil if we ask. This has dramatically decreased our waste, as foam is not recyclable, no matter what people claim. It also makes me proud as a kayak-er and lover of beaches and rivers to avoid contributing in any way to the degradation of these places, as even “properly disposed of” foam often blows or flows downstream to the ocean. We can recycle tin and hard plastic containers, and do so. We also keep some decent reusable hard plastic take-away containers in our car and usually bring those into the restaurant to use, instead of using “new” containers. This significantly reduces the waste piling up in our garbage container. The additional benefit here is that it is easy to put away half of my dinner so I don’t eat the gargantuan serving that most restaurants bring to the table. And I love leftovers. Straws and lids – yes the big brew-haha of late! My husband and son and I went to a restaurant last week and were “graced” (hah) with no less than six plastic straws we did not want and did not use in the course of our one-hour back-deck dinner, overlooking a river, no less. Each time the server brought water or a drink, there was a new plastic straw, opened, in the glass. It would make a vast difference if the server asked if we wanted a straw, or even if the straws remained unopened until we chose to use them, and the server was willing to take back the unused ones. I particularly deride Subway for their plastic-wrapped plastic straws, which add insult to injury, though I have the choice of using them or not. 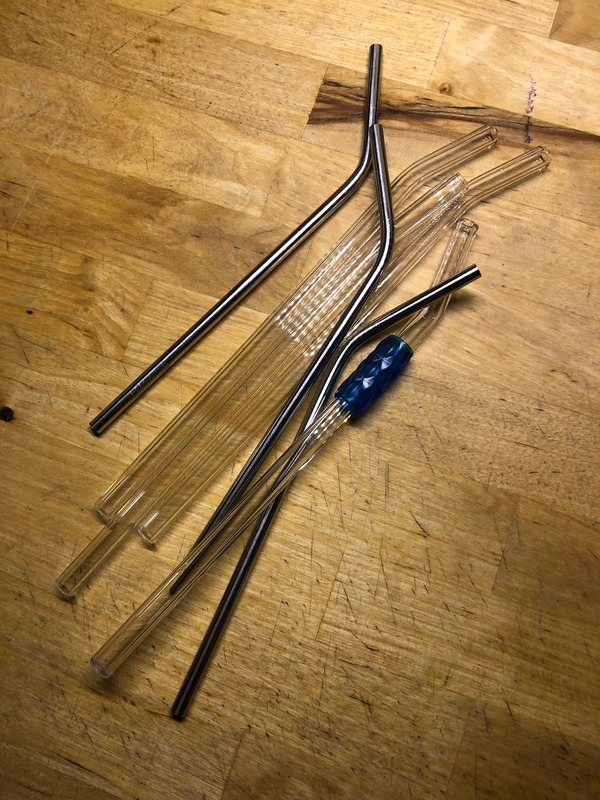 At home, we have glass and metal straws, and we carry three durable straws in the car for when we travel. I have a glass straw in my backpack all the time to use at conferences and in restaurants, and for any drinks I buy roadside when traveling. The hard part, still, is getting a drink without a straw already wastefully placed into the glass. I have now started asking for drinks without plastic lids when that will work for me. I use a durable metal coffee mug, and avoid throw-away lids and cups always in that case. Remember that when you buy a coffee, the paper cup is not recyclable (most are plastic or wax lined) but the lid is. The heat sleeve is recyclable, as well, if it is paper. Please recycle what you can. Single-use water bottles, juice, tea and soda bottles. – Wow. I almost forget to include this because we just don’t do it anymore, and have not for years. We use a Soda Stream at-home soda-maker if we need soda, and a Brita filter for water. I mail back to Brita the Brita filters for recycling, and recycle the plastic syrup bottles for the soda stream. Municipal water is nearly always cleaner and better regulated than bottled water, despite the issues seen in Flint, Michigan and Hoosier Falls, NY. It is certainly cheaper, and better at ensuring that the water stays in its water system of origin (aquifer area), unlike shipping bottled water all over the world. Please don’t buy Fiji water unless, of course, you live there. Throw-away plastic utensils – I am now working on avoidance of single use plastic utensils. I carry my own set of metal utensils in a zipped neoprene case, and take the utensils out when I know the restaurant or event will use plastic. Easy-peasy. We have also started asking delivery restaurants to not give us utensils, condiments or napkins. We are getting delivery at home one or two times a week and we have all these items readily available at home, without creating additional plastic waste. I give a higher rating via Grub-hub to places that help us with this. 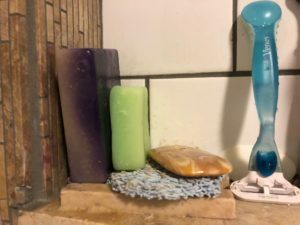 Shampoo, conditioner, and soap bottles – I now use shampoo, conditioner, and soap BARS. This is amazingly cool. I love the shape my hair is in, and totally love the quality of the bars I use. They are a bit pricey up-front (the conditioner bars, anyway) but enough time has passed that I am pretty darn sure they will last way longer than a bottle full of liquids. And there is no bottle to recycle or dispose of and no plastic pump lid to throw “away” due to the complex mix of plastic types included. 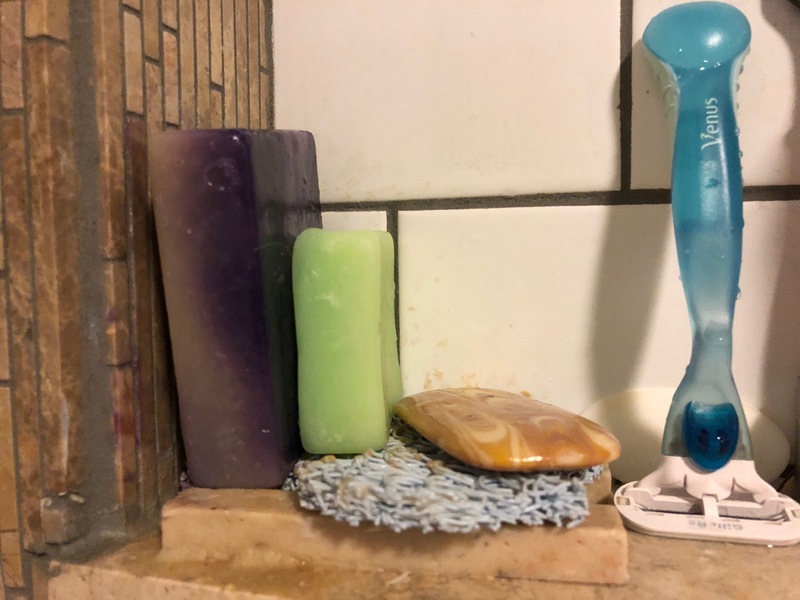 Shampoo bars contain no emulsifiers or suspension agents or anything I don’t need and they are much less weighty to ship or to haul home from the grocery as well. Plastic wrap – I am slowly moving to beeswrap and other durable bowl covering options, trying to eliminate plastic wraps such as Saran Wrap. And there are ways to make your own durable bowl wraps and covers that I still need to try. Bamboo toothbrush – I purchase bamboo toothbrushes and refuse to take plastic ones from my dentist when I visit. The bristles are bio-based nylon, and I pluck those for the garbage before composting the bamboo handle in my home compost bin. I’m not there yet with my razor, but hope to get there at some point. Cloth vegetable bags – I have these and have used them, but have not yet developed the habit of using them all the time, which I am working to remedy. When I do use them, they keep my vegetables and fruits well in the refrigerator. I also need to figure out deli bags. I’m not sure my local grocery will let me provide a bag to use, but I need to ask, absolutely. I’m not sure what they would put the price sticker on, but maybe I could bring a durable glass container, have them price the salami, and hand me the sticker with the meat stacked on the deli paper. I know that even asking can be the catalyst for a change. In the meantime, I recycle deli bags with the plastic film recycling process. The act of asking can be the catalyst for a change. Celebration plastics – we now never use single use throw-away plastics or papers when we have a gathering. We use durable glasses, plates, and metal utensils. We may have to run the dishwasher twice, but it is well worth it not only for the environment but for the quality atmosphere. People feel more important when you use china, glasses, and metal utensils. Ongoing – We have not yet figured out plastics included in packaging, as we order online a lot primarily through amazon (yes, I know this is a sustainability nightmare!). We do try to select frustration free packaging, which is often plastic-free, and we recycle everything that can be recycled (remember to look not only for numbered plastics, but numbers that your local service can actually process). I cannot directly affect production, but perhaps my purchasing habits can inform it. The nuisance plastics such as plastic wraps on the caps of aspirin bottles and sodas are, to me, an indicator that our society has totally abandoned the environment that supports us. These cannot be recycled, normally, and are pernicious waste we can’t avoid unless we stop purchasing anything from contemporary production. Therefore production must change. I cannot directly affect production, but perhaps my purchasing habits can inform it. I know I have more work to do, and the future “wins” will likely be hard-earned as I have done quite a bit already. That’s fine. In the meantime, I’m also trying to pick up plastic garbage when I’m out and about. It is easy to pick up 3-4 pieces of plastic garbage between my house and the grocery store when I walk there, and each piece of plastic I dispose of or recycle properly improves my neighborhood and our world. I don’t have to drive myself crazy about this. I can choose to not pick up something icky, or when I’m in a rush, or when I just don’t feel like it. I have given myself permission to do better when I can, and to not beat myself up when I can’t. And yet, every piece of plastic is a solid win. I want to have the choice to avoid plastic, in every situation. I don’t want people and established processes to force me into bad habits and waste. I would vastly prefer to be able to make a choice myself between aspirin in plastics with plastic protection lids, or bulk aspirin from the pharmacist that I can take home in my own container. Some Co-Op groceries can help with this, reaffirming that most greener solutions are local and community based. If you need a disposable straw, you should be able to get one, and I should be able to enjoy dinner without one in my glass. I would certainly prefer a default of no straw at restaurants, and a paper or reusable straw as the offered option. There is a place for plastic. We should use this necessary and valuable material for durable uses and for items where we need high sanitation levels, such as the blood bag for my Red Cross donation, and avoid using such a long-lasting material for single-use items we plan to throw “away”. Really, who thought of that?! What choices can you make to be greener?